For those of you who have been following this blog recently, you may have noticed that I have become obsessed with Flash Fiction. I love reading it and writing it. Some of you may not know that I am very new to the Flash Fiction community online. I stumbled upon this wonderful site, The Angry Hourglass in early March. The idea of writing short stories in under 500 words intrigued me because I have such a short attention span that I used to get bored with my stories/characters when I attempted writing longer works. Well, little did I know, this was just one site out of a whole community of Flash writers and weekly contests. I then hopped over to Flash! Friday, another fantastic Flash contest. I started entering a few and I was hooked. Well, I started noticing something among this wonderful community of writers. They were all talking about Flash Dogs. It seemed that this was the “must have” book for flash writers. So I looked it up and found out that it was an anthology of flash fiction stories written by many of the writers in this online community. I knew that I HAD to have this book. My budget, however, had something to say about it. So I put it on the back burner. 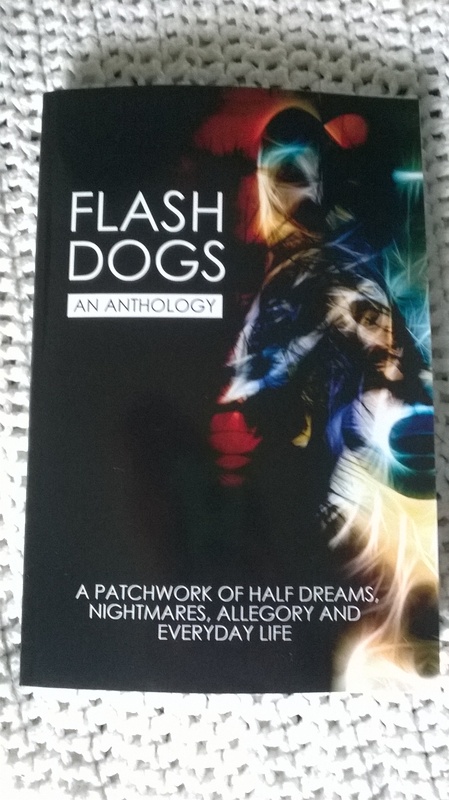 I also discovered that Flash Dogs was in the process of publishing another anthology and many of the weekly contests had a Grand Prize for a chance to submit stories for the second book. I was, and still am, very new to this form of writing so I didn’t have ambition to really try to get in. I need to get my feet wet and get more involved in honing my craft before I’m published, but I am hoping that they are planing on publishing more anthologies in the future and it will be my goal to get in one of them!. Anywho, I was recently given an amazon gift card, HOORAY! So I ordered the book first chance I got and here it is!! I can not wait to delve in!! It’s a Great Month For Writing! I have recently plunged myself deeper in to the writing world, becoming more serious, and trying to set some goals. Here is a quick update on my writing life. 1. Last week I was introduced to The Bridge Literary Center. The Bridge is a group of writers from several counties in Northwestern Pennsylvania that get together from time to time for different writing workshops. They are in the process of publishing their second literary journal and are accepting submissions. I was encouraged to submit a few pieces. I am currently having a flash story edited and and working on a few poems for the journal. This is the first time I will be trying to get published in print. Exciting stuff! 2. Yesterday one of my flash stories appeared on The Drabble. This is the first time one of my stories has appeared elsewhere online other than in the comments section of flash contests. Be sure to check out my story here! 3. This past Monday I attended a meeting of a wring group (name pending) at a local library. This group is just starting out so this meeting was very casual. There was just a handful of people but I expect it to grow quickly. I am excited to see how this group develops. Great things are going to happen there, I just know it! Putting myself right in the middle of the writing community in my area was a very scary thing for me, as I am very shy about my work which is why I was anonymous for more than a year on this blog. But I’m never going to get anywhere if I don’t move forward right? So here’s to new adventures! While looking for a poem I wrote the other day amongst my many saved posts and documents, I stumbled upon two stories I had saved and hadn’t gotten around to completing. One of them was just a few weeks ago, the memory behind writing that particular story was still strong in my mind. So, I was able to finish it, a flash piece just under 600 words. The second story, I have a vague memory of writing, but nothing concrete. It was a very rough draft full of mistakes, but there is some major potential there! I left myself in suspense because the story just stopped mid thought. I want to continue this story! The sad part is, I don’t remember anything about it. I have no idea who the main character is, what makes her tick, or what her back story is. And, I have no idea where I was going with it. But there is a great adventure there my friends and I hope to be able to continue it. It may even have novel potential! But right now it is just a one page mystery that I hope to uncover and maybe someday reveal to the world! It has been one day since I gave up Facebook. Do you know how many times I have reached into my pocket, took out my phone, and almost brought up Facebook? Once thing I have learned is I have the urge to share some pretty random things that, before Facebook even existed, I would have never thought to share. Why do people need to know that I’m eating my 3rd bowl of chicken soup? My cat was in a crazy position yesterday. I took out my phone to take a picture and remembered that I can’t share it on Facebook so I didn’t take the picture…why? It is completely crazy that we weigh everything we do by what other people might think about it. The value of a statement or picture is determined by how many “likes” it gets. I know I am not the only one who does this. I am going crazy because if I don’t share my day with people I feel alone. To be completely honest, I haven’t used my extra time to read the bible or spend time with God. He craves time with us. He wants to be the one we tell things to. He wants to share in our musings. But my first instinct is to pull out my phone and tell anyone else who will listen. I know what you must be thinking…that that is so ridiculous. I realize that many [if not most] people love, like, and/or coexist with these so called “beautiful creatures”. Not me. I also realize that hate is such a strong word but it might not be strong enough to describe exactly how I feel about these hideous beings. Did you know there are actually people out there that have a legitimate fear of them? Now I can’t say that I’m afraid of them. Not truly. I mean I know that they are not going to hurt me, although they could cause harm unintentionally. I once read a true account of a person who was riding their bike when they were a kid and a butterfly flew in their face and caused them to crash. They fell into an in-ground pool and their pants got caught in the bike pedals and they almost drowned. That would surely cause someone to be afraid of butterflies. No butterfly has ever caused me harm, intentionally or otherwise, but I still don’t like them. I hate all bugs. And people don’t seems to realize that butterflies are bugs too. They are. Their “pretty wings” don’t fool me. They still have nasty bug bodies. They are ugly under the pretty exterior. Much like the things of the world. When ever I see a butterfly I immediately tense up. I can’t help it. Everything in me starts to crawl. Like that horrible feeling you get when someone drags fingernails on a chalk board or with the sound of metal against metal. If one were to land on or very near me I freak out. I guess it is a fear. A very irrational fear. But really it’s just a deep deep loathing. Upon reading those words I immediately tensed up, but continued to read the description of what will take place during this session. They will be hearing stories and singing songs and playing games and making a craft all pertaining to butterflies. Ok…I can deal with that. Pictures of and reading about butterflies make me uneasy, but I don’t actually have to touch or be near one so I could handle it I think. But then the last sentence sent chills through my body and I’m sure the color drained from my face. I mean, I know what a butterfly garden is but where was said garden? I’ve never seen one nearby, thank goodness! I politely asked the librarian where this would be taking place. Why does this bother me other than the fact that it deals with butterflies? Well, I live ONE block from our town library!!! For those of you who live in big cities and don’t know what a small town block is like it’s about 2 to 3 houses and 1 church away! That means That not only will I have to walk past the library many times to get anywhere in this very small town, they might find their way to MY yard!! Just the thought is making me freak out. Yes, I’m sure there has been the occasional butterfly near by. I can deal with that. I just wait for it to move on or run in the house till I am sure it’s gone. But this will mean more than one butterfly. We could even be talking swarm here. SWARM! This is NOT a good word. I am freaking out…Freaking. OUT!